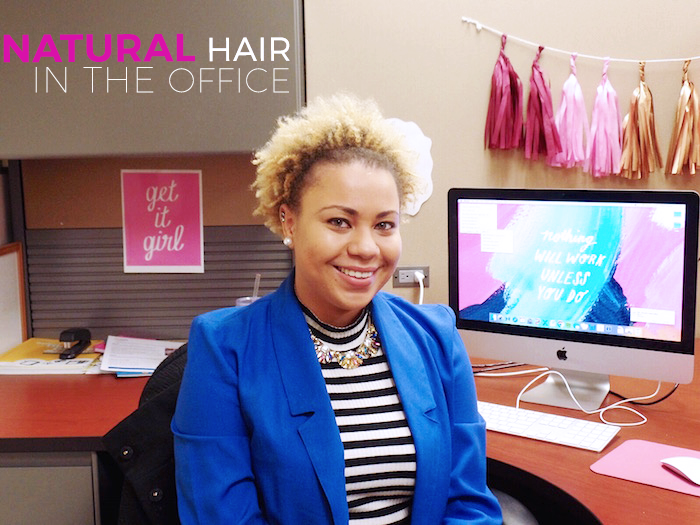 wearing natural hair in the office. Black women wearing their natural hair in the office has been up for discussion since long before I ever decided to give up relaxing my own hair. Yet, I have always found it to be a pretty interesting subject. There are many black women out there who believe that wearing their natural hair to interviews has actually cost them job opportunities. I myself will never forget walking into an interview during my after graduation job search and seeing the interviewer's eyes get huge after she spotted my hair. Maybe I didn't get a call back because I just wasn't the right fit, or maybe it was my noticeably awesome blonde kinks and curls? Who knows. I have always found it puzzling that someone could actually get looked over for a job or be seen as less professional, not because of their lack of skills but for the way that their hair naturally grows out of their scalp. I think I first truly understood that this was a real issue when I was still in college and I spoke with my cousin about a situation that she was experiencing at her own job. Though she usually sported her hair naturally, she went through the interview process and was hired while wearing her hair straightened. After a few weeks she decided to wear Havana twists as a protective style and didn't think much of it. She ended up finding out later that her manager was going around the office and complaining to other managers and employees that he thought he had hired "Corporate Camille*" and was disappointed that she was no longer wearing her hair straightened. That story stuck with me all the way up until it was time to begin my own job search after graduation. Before I began my search, I decided that I would not be straightening my hair for any interviews. I knew that this was the way that I planned on wearing my hair for a long time and I wanted to know that my future employer would be accepting of that. I was also aware of numerous women out there killing it in their fields while wearing their natural hair, from top professionals to CEOs. Why couldn't I? Though I may or may not have gotten that call back after that one interview because of my hair...oh well, it just wasn't meant for me. I continued to interview and brought my best self each time, natural hair and all. I was eventually blessed to earn an interview with and shortly after be hired by an amazing organization that I have never known to dwell on hair texture. Approaching my 1 year anniversary, I've even been able to wear protective styles such as box braids and never once felt uncomfortable. My advice to any black woman who has made the decision to wear her hair in it's natural state in the workplace is to keep your head held high! If a company is really that small minded, you probably don't want to work for them anyway. I’m a girl of many hairstyles, sometimes I’ll feel like wearing braids, other times I might have the urge to flat iron my hair. However, at the end of the day…I know that my hair does not define me but enhances me. My hairstyle of choice has absolutely nothing to do with my ability to do my job. If anything, it just helps me to look better while doing it! Check out these 8 top professionals and CEO's who are natural and winning! Absolutely love this post! I can't relate, unfortunately, but I'm happy you're disucssing this. It's absurd to me, too, that a company would discriminate against a woman for simply wearing her hair the way nature intended. You know that'd never happen to a man either. Whatever company that is, is not one I hope you or I ever have to work at and compromise our values for. Much love and again, great post! This hair style is really very good. this is the perfect for office time.